Now that a week has passed since the PCUSA decided to turn the clock back to 2004, rejecting four previous General Assembly votes and moving full-steam ahead on divestment once more, there is very little to do but watch the completely predictable consequences of their decision play out. Remember that this is a church which has been told for over a decade that divestment – which would lump the Jewish state in with Apartheid South Africa and genocidal Sudan – represented an assault on Israel’s legitimacy and a direct attack on the most important Jewish project of modernity. They have been told by their members time and time again that divestment does not translate to a form of peace-making and even-handedness, but rather represents taking a side in the conflict. 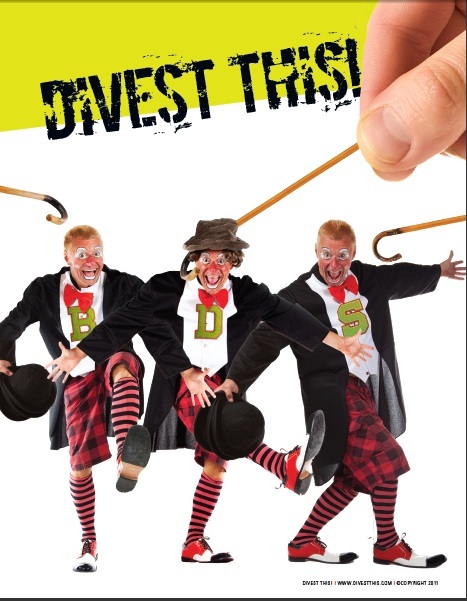 They saw those same members say “No” in divestment votes taken in ’06, ’08, ’10 and ’12. And still divestment advocates within the church (enabled by a leadership that has more in common with Sabeel than with their own parishioners) pressed on. This alliance of boycotters and corrupt leaders continued with their single-minded program, even after Zionism Unsettled shouted to the world the real agenda behind those anti-Israel partisans who have forced divestment onto the church for over a decade. And they took their vote the moment Israel was looking for its now-murdered children in one territory controlled by the PCUSA’s Palestinian “peace partners” and rockets were being fired into the country from another. As I’ve noted before, the Jewish community is diverse (i.e., often at each other’s throats – especially on matters related to the Middle East), but patient (as demonstrated by a decade of turning the other cheek while PCUSA prepared the next slap). But patience ceases to be a virtue when it enables immoral behavior. And I think it’s telling that in a community as diverse as ours, advocates for BDS are one of the few groups not allowed inside the Big Tent. And so the condemnations have poured in from Reform, Conservative and Orthodox movements who agree on little beyond the holiness of Torah and an abhorrence of BDS. Even stronger statements have been issued by virtually every community organization in the country (other than Jewish Voice for Peace – the “interfaith partners” PCUSA leaders obliquely refer to when they claim that divestment has support within the Jewish community). More importantly, Presbyterians who warned church leaders what would happen if they continued to insist on pressing divestment are speaking out. And while I don’t expect whole churches to break away from PCUSA over last month’s divestment vote, I have heard from individual Presbyterians that this vote was the last straw that has caused them to start looking for a new religious home far from the contamination of Louisville. And given the options churches have to leave this branch of the denomination and still be considered Presbyterians, it would not surprise me to see emigration contribute to the decline of PCUSA as much as the death of the old and disinterest of the young. A number of people have commented on the “deer-in-the-headlights” performance of PCUSA Moderator Heath Rada as he took to the airwaves trying to explain that last month’s vote does not diminish his denominations love for the Jewish people and devotion to Israel’s continued existence. But after 2004, after Vigilance, after Zionism Unsettled, and after a decade of hearing Presbyterians take to the stage on GA after GA accusing Israel of every imaginable crime, it should come as no surprise that the Jewish community has finally decided to judge the organization by its deeds, rather than its words. The only thing about the aftermath that caught me off guard was this call by PCUSA leaders asking individual churches to reach out to synagogues with whom they have good relations to explain that a return to 2004 should not be seen as an attack on Israel, a joining of the BDS movement, or anything other than an act of peacemaking and love (supported by statements saying just that within the divestment resolution which passed at the 214 GA). The trouble is, any Presbyterian Church with a strong relationship with the local Jewish community knows those statements are just a form of equivocation by an organization that – even while assuring their Jewish “friends” that they are not part of the BDS “movement” – can’t seem to find the time to ask that movement to stop claiming PCUSA as a friend and example of what other churches should do immediately. In other words, local church leaders who have built up enough trust to explain PCUSA policy to offended Jews are the very ones who warned PCUSA of the perils of continuing to push a divestment agenda at all cost. Which means that Louisville is counting on those Presbyterians most against the policy they forced onto the organization to repair the damage their reckless decisions have caused. Perhaps pastors like Mark Davidson will be able to sit down with his local interfaith partners and convince them that PCUSA is sincere in its love and peacemaking (after riding over to the synagogue on a bus plastered with the anti-Israel ads his church has sponsored). But my guess is that the Jewish community is ready to maintain friendly and productive relations with local Presbyterians who (like most Presbyterians) reject divestment, cordial relations with those who support the policy, and no relations with PCUSA at a national level. In other words, our involvement with PCUSA should be treated as an entirely local matter. Which means we should treat Louisville and whatever Louisville and its real friends and partners at Sabeel, IPMN, and JVP cook up over the next two years with the same indifference and contempt it will be shown by the rest of the world. As I noted last time, one of the strengths of American religious culture is the ease with which someone who dislikes their local church is free to start their own. And while PCUSA has shown itself ready to fight to the death to hang onto its property, hanging onto its membership seems pretty low on their agenda. So perhaps this year’s GA can mark the beginning of a new era of Jewish-Presbyterian relations, one which has no use for a PCUSA national organization and agenda that has caused so much misery to others while hastening the death of their own denomination.